It might come as a surprise to many that there is a wide range of occupational hazards associated with professional cleaning. The fact, however, is that workers in the cleaning industry face some risks and are injured at a higher rate than workers from many other sectors. Slips and falls, particularly while performing cleaning services. Exposure to harmful chemicals like disinfectants, pesticides, floor cleaners, oven cleaners, and drain cleaners. Skin burns and irritation in the eyes, nose, and the skin caused by caustic cleaning agents. Allergic reactions and infections caused by soaps and detergents as well as chemicals. 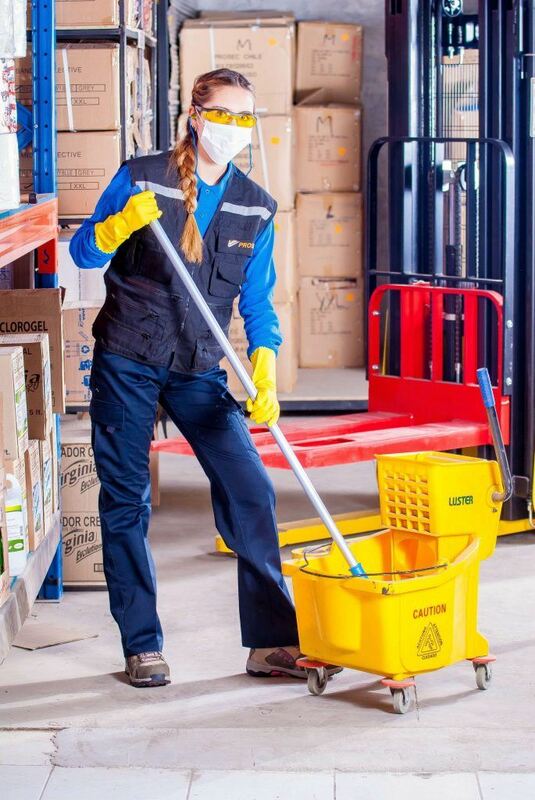 The occupational hazards involved in professional cleaning can be reduced to a great extent by following the standards and regulations set by the Occupational Safety and Health Administration (OSHA). There are some OSHA-recommended safety measures that employers can implement to minimize the hazards at the worksite and provide a safe environment for cleaning workers to do their job. Floor holes must be covered or guarded with railings to make sure workers accidentally do not walk into them. Fall protection mechanisms must be provided for those who work at an elevation of four feet or above. If there is a possibility that the worker could fall into a machine, a conveyor belt, a vat of acid, sharp objects, and other such things that could be potentially dangerous, fall protection must be provided irrespective of the elevation at which the worker is required to work. Workers must be provided with personal protective equipment like aprons, gloves, protective glasses, and slip-resistant footwear. Wet cleaning methods can be replaced with dry cleaning methods wherever possible to reduce the risk of slips, trips, and falls. All the cleaning products must be properly labeled in a language that the workers clearly understand so that they do not accidentally use the improper product for the wrong purpose. The electrical and mechanical equipment used in the cleaning process must be inspected thoroughly on a regular basis to make sure they are in proper working condition and safe to use. Cleaning workers must be educated about the risks associated with their job and trained in safe work practices. Workers should have a clear idea as to what constitutes a hazard, how to recognize it, and how to safely deal with it or avoid it altogether. Workers must be trained to use cleaning products safely and appropriately. This is particularly important because using the wrong product or mixing two different products accidentally could have serious consequences at the worksite. For example, ammonia is commonly used as a cleaning agent and chlorine is widely used as a disinfectant. Mixing both solutions, however, could produce chlorine gas, which is poisonous. Workers should be informed about the fire alarms and emergency exits at the worksite so that they know what to do in case of an emergency. Most importantly, the training program must be conducted in a language that the workers can understand and are fluent in. Generally, trained workers are less likely to be involved in workplace accidents compared to those who are untrained. So, cleaning workers must not only be educated but also be assessed on a regular basis to make sure they are best suited for the job they are required to perform. Watch YouTube Video: Cleaning Chemicals, Protecting Workers & Indoor Air Quality. This video provides safety tips on how workers can protect themselves while using cleaning chemicals. I’m Ed Smith, a Sacramento Workers’ Compensation Attorney. The consequences can be devastating to both you and your family if you have been injured on the job. If you need the assistance of an experienced worker's compensation attorney, call me at (916) 921-6400 or (800) 404-5400 for free and friendly advice. Our client reviews are on Yelp, Google, and Avvo. You can see our past Verdicts and Settlements on my website, AutoAccident.com.